Jazz center Rudy Gobert joins NBA TV to discuss Game 2 and what Utah needs to do defensively to contain James Harden. The Rockets were playing 5-on-4 for much of this game. Will Utah’s strategy change in Game 2? The Starters discuss. 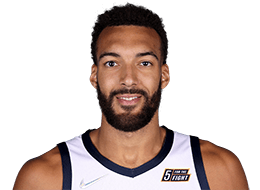 Born on June 26, 1992 in Saint-Quentin, France ... Last name is pronounced “go-BARE” ... Father played collegiate basketball at Marist College ... Owns a 7-9 wingspan and 9-7 standing reach, the largest ever recorded at the NBA Draft Combine ... Wears a size 20 shoe ... Hosted youth basketball camps in his hometown in the summer of 2015 ... Chose jersey No. 27 because he was the 27th overall pick in the 2013 NBA Draft ... Was a boxer when he was younger ... If he wasn’t a basketball player, he would participate in a combat sport - such as boxing or MMA ... Favorite TV show is Game of Thrones and favorite movie is Lord of the Rings ... Follow him on twitter at @rudygobert15.